“This article takes a critical look at the following three key characteristics in recent judgements of the Inter-American Court: judicial activism, punitivism and supranationalisation. 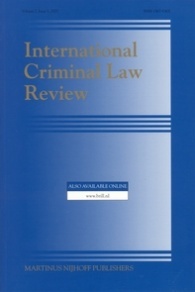 First, it seeks to illustrate that the Inter-American Court has modified in some significant regards the legal framework agreed upon by State parties (judicial activism); second, that this activism has undermined some of the liberal guarantees limiting the State's power in criminal matters and has led to the creation of a law of exception (punitivism, or illiberal and contra conventionem judicial activism); third, that the Court, on the basis of the Convention's provision on reparations, has required States to adopt measures that negatively affect their sovereignty, and has thus become dangerously close to acting as legislator, judge and supreme administrative authority of the American States (supranationalisation)”. Oswaldo este tema se debate bastante en argentina por un artículo de Daniel Pastor "La deriva neopunitivista de los organismos de derechos humanos". El artículo entiendo que lo escribió porque fue el abogado por la Argentina en el caso Bulacio y perdió.